The purpose of this remote antenna switch is to select between Doublet and Tee operation on 160m. Tee operation provides about 12dB improvement over the antenna used as a Doublet on this band.<?xml:namespace prefix = o /> A further relay alows selection of a separte vertical antenna if required. A G5RV (ZS6BK) multiband wire antenna. 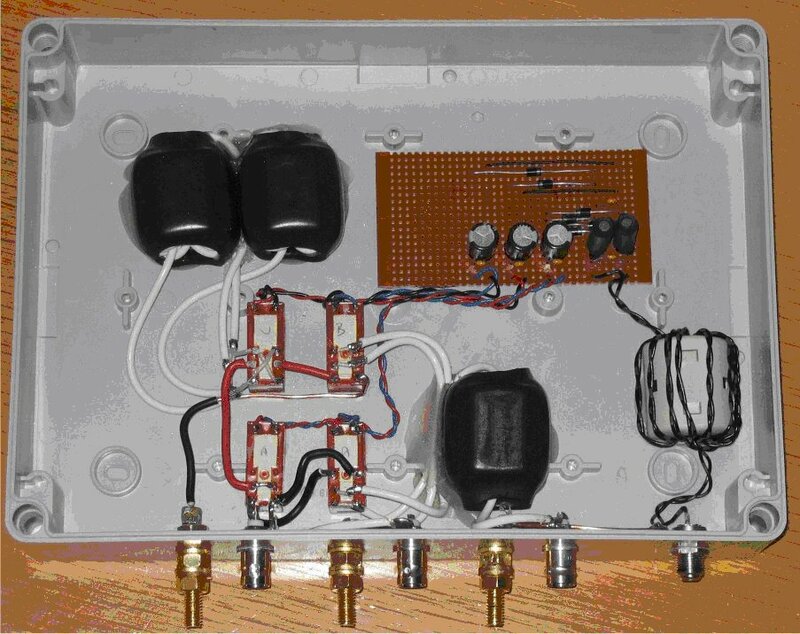 Used on most HF bands. Or the G5RV but configured as a T by strapping the balanced feeder together at the base. The antenna then acts as a vertical dipole fed against a counterpoise attached to a fence 2m above ground. Mainly used on the LF bands. The unit was designed to work at RF power levels of around 100 watts. Design considerations become progressively more difficult beyond this power level as the peak voltages and currents which may be generated require high voltage relays, heavy gauge wire and increased spacing between components in order to prevent damage occurring. In order to further improve performance on 160m, the 50 ohm coax is coiled with about 20 turns on a 4 former at the point it connects to the 450 ohm balanced feeder. This operates as a loading coil when the feeder is strapped by the switching unit for 160m and as a 1:1 balun (only effective on the higher frequency HF bands) when the antenna is used as a doublet. An additional ferrite cored 1:1 balun in the switching unit provides improved feeder isolation on the LF bands. Control is achieved by feeding either zero volts, a positive voltage, a negative voltage or AC down a control cable from the shack to the remote switching box located at the antenna base. The remote switching circuit is housed in a waterproof box, with a removable lid. This is secured on a wooden fence at about 1.5m above ground. Connecting cables are attached to connectors on the bottom edge of the box, and are waterproofed with self-amalgamating tape. Care has been taken to ensure that the RF and control cables have sufficient choking impedance to prevent unwanted electrical noise from nearby properties from entering the antenna system. Earth and counterpoise connections are switched between the different modes in order to further reduce the introduction of unwanted noise and interference. The relays I selected were DPCO high sensitivity models rated at 12v DC operation (RTE24012). rectified and smoothed this gives a DC output of about 11-12v which is more than sufficient to operate the relays, even when using a long control cable. Photograph showing the internal layout of a prototype unit. The relays and ferrite transformers were secured to the inside of the box using hot melt glue. Brass 6mm bolts provide earth connections. A stylised system diagram is shown below. Here's another design, this time it is used to switch a doublet fed with 450 ohm ladder line between being a balanced antenna or a 'T' fed against earth or raised counterpoise wires. It uses similar principles and components as in the previous version.